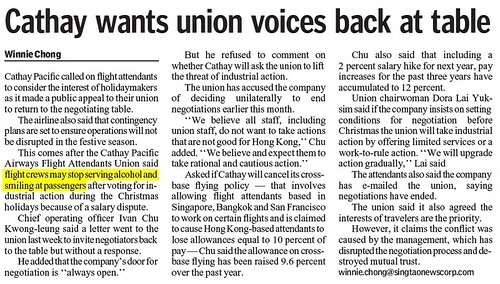 I am slated to fly home for Christmas and New Year and my heart sank when I initially heard of the news of cabin crew planning to go on strike. I tried to changed to another airline but alas due to the last minute nature of my attempt, there were no seats available on other airlines for that period. The news above was a couple of weeks later when the strike threat was averted and may just be reduced to a work-to-rule silent protest instead. No alcohol. That one I can accept. So anyway, the CNN update was saying that Christmas will be saved while the union may considering striking from New Year's Day. Frankly, I don't care already for two reasons. If strike from New Year's Day, I go back to work later lor! WOOTS!!! My Chinese New Year home flight is on SQ and so bor wah eh tai jee liao loh.